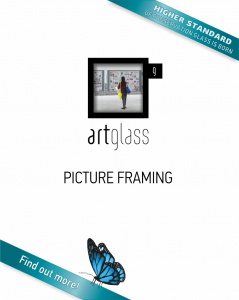 For a safe and enduring framing of larger pieces choose the Artglass AR 99 Protect™. It will additionally guaranty a reflection free and enhanced clarity performance. The optimal thickness of 4,4mm laminate consists of two panes of glass and a polyvinyl butyral interlayer bonding the glass panes together and preventing the glass from splitting up into large sharp pieces when broken. This type of glass also provides an absolute UV protection* by blocking out 100 % of any harmful rays.